Spring is here and you’re raring to get your garden in. Well, hold on just a minute. Sowing seed or planting seedlings at the wrong time will bring nothing but heartache. Right about now in the Willamette Valley, you can get away with planting cool-season vegetables like peas, arugula, mustard, radish and turnip in prepared planting beds. Also, carrots, beets, scallions, chives, parsley and cutting greens that are easy to grow from seed; or plant already-started transplants of kale, head lettuce, chard, leeks and onions. 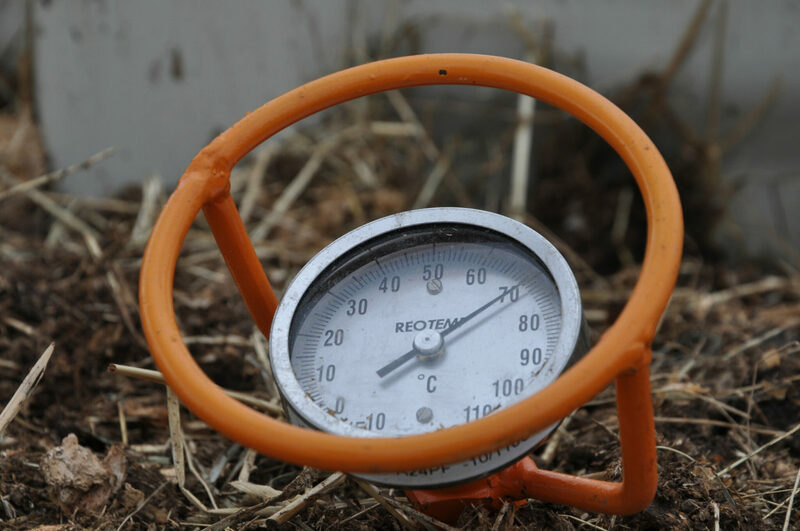 An inexpensive soil thermometer helps keep planting time in perspective. If you can’t resist the urge to plant warm-season vegetables, Miller recommended using some sort of protection from the chill like floating row cover, individual glass or plastic cloches or even milk jugs or soda bottles with the top cut out and turned upside down over plants. For directions on building a large, greenhouse-type cloche with PVC pipe and plastic, check out the OSU Extension guide on How to Build Your Own Raised Bed Cloche. Whether the relatively warm winter will mean soil warms earlier this year is a matter of conjecture, Miller said. There still could be a cold snap this month. You’ll find more information about vegetable gardening, including schedules for planting 45 vegetables in all regions of Oregon, in the comprehensive Extension publication called Growing Your Own. You’ll also find information on how far apart to space plants and how much to grow for a family of four. Prepare the soil. Before planting, add a moderate amount of compost (¼- to 1-inch) and a balanced fertilizer (all three numbers on the bag are the same) according to package directions. Incorporate the materials into the top 8 to 12 inches with a digging fork or spade. Rake bed before planting seeds or transplants. For new garden beds: Remove sod or weeds to expose soil. Liberally add 4 to 6 inches of compost, agricultural lime and a balanced fertilizer and incorporate into the top 8 to 12 inches with a digging fork or spade. Prepare seed or transplant bed with rake. Next fall, add 5 to 10 pounds per 100 square feet of lime to beds. In addition to adding complete fertilizer to the soil, use a soluble fertilizer like fish emulsion for transplants, especially early in the season or if the plants are not thriving. Use transplants when possible. Crops that do best when seeded directly into the garden include carrots, parsnips, beets, radish, turnips, mustard and arugula. Most other crops can and should be transplanted to make the gardening process easier, particularly for weed control. Grow your own transplants or look for high-quality starts (not root bound, stunted, off-color) at the garden center for best results. Control weeds early in the growth cycle of your veggies. Plan to weed your veggie beds at least once per week for the first four weeks of the plants’ growth to get the edge on this ongoing challenge in the garden. Monitor and control slugs and other insect pests, often. Keep an eye out for slugs. Find them under debris and in the folds of plants and dispatch them by dropping into soapy water or cutting them in half with scissors. Look for aphids, imported cabbage butterfly larvae, and other pesky critters on the underside of the leaves. Squash them!